Sometimes I wonder if Cisco loves his job as much as I love him having his job. On more than one occasion I have said that I have the greatest job ever…I am an art teacher that takes her dog to school! Sounds simple but running the art department and running the school dog department can get hectic at times. Since my days are filled with classes and other school-related activities sometimes Cisco just “chills” in the art room while I go off to meetings and such. It has become his second home (and like many teachers, sometimes he feels like he spends more time in that classroom than his actual home!). He is the art dog and he takes that seriously. He lays under tables while kids are exploring repetition through work inspired by Jim Dine, he finds a comfy spot on the edge of a large-scale doodle project that multiple 8th graders are working on and he relaxes right in the middle of the students working on still-life drawings. 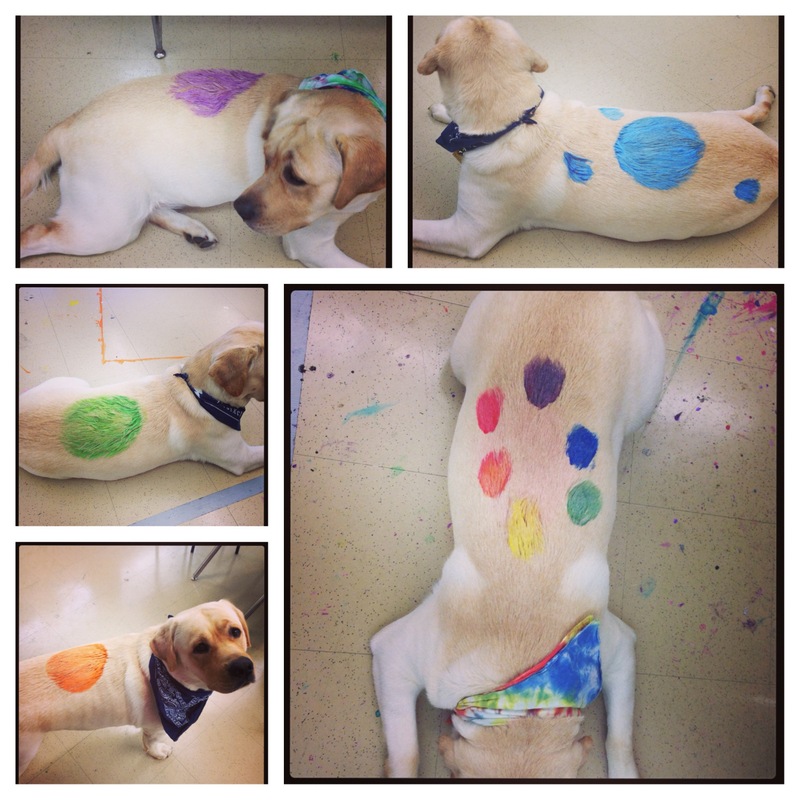 He took his “art dog” job to a new level as the Trinity community celebrated International Dot Day in September. This celebration is based on the Peter H. Reynolds book “The Dot”. If you have not read this masterpiece you simply need to! It is an amazing picture book about a young art student who is struggling to find her artistic voice. I ADORE this story and have used it as inspiration for the art program for years so you can imagine my joy when I discovered an international celebration of “The Dot”. I signed Trinity up and then decided that a Dot DAY was simply not enough…we needed a Dot WEEK. We put units and lessons in-process on hold and the entire K-8 student body created DOTS (drawings, paintings, mosaics, sculptures…you name it, we made it!). The young Kindergartners got to experience the story for the first time while the seasoned 8th graders moaned, “not that story again!” while secretly LOVING the long lost read-aloud. The words “make a mark” filtered through the halls and the faculty and staff even got in on the action by making “Ish” drawing during the wednesday faculty meeting. By the way, “Ish” is another FABULOUS picture book by Mr. Reynolds that goes hand-in-hand with “The Dot”. To kick off the week, Cisco used his Greet the Week (monday morning community meeting) time to share the activities of the upcoming week to the students. To get everyone excited, he wore a few hand-painted dots on his back! With the patience of a saint, he sat still as I applied layers of washable tempera paint to his beautiful fur. As he trotted down the hall the kids couldn’t help but squeal with excitement at his “new do”. I honestly had no idea that painting a dot on his back would create such a buzz for our Dot Week but it did! As the week moved on students would seek him out to see what color his dot was each day. Classes got to vote on the color for the next day and a few middle schoolers even got to paint the dot on morning. By Friday, he rocked the color wheel…6 DOTS!!! The kids loved it (and every one of them knew that he was wearing the primary and secondary colors in the correct order!). Dot Week was a raving success and the results still adorn the hallways in the school…it is just too happy and inspirational to take down! First grade “Ish” drawings reside proudly next to beautiful crafted fifth grade Dot mosaics made with bottle caps. A month later I still have students ask where Cisco’s dot is…it had a lasting effect for sure! This week illustrates how amazing my job is and how lucky I am to teach within such an amazing community. Cisco stood next to me every day as I painted his fur and passed on my passion for art to anyone who would listen. I urged everyone to read the book then I actually recorded my own voice reading the book and sent it to the faculty and staff, forcing them to understand the power a story can hold. In the story, the young art student battles the “blank page”, saying, “I just can’t draw!”. How many times in our lives do we have this feeling…”I just can’t….”? Students are pushed to conquer the “blank page” in more ways than many adults can understand. The “blank page” is the unknown and that scares the heck out of most people. The “blank page” is a new job, a new relationship or an unexpected change of scenery and the “blank page” is simply scary. I see Cisco as my “blank page” sometimes, waiting for me to “make a mark”. He teaches me something new about myself and the world every single day. He comforts when necessary and seems to know exactly when to bring you one of his favorite toys with a loving invitation to play. He listens, challenges, loves, and entertains every person he meets but has a special place in his heart for the students he works with every day. So when your “blank page” gets a little to scary remember Cisco and go out there and “make a mark”!